Happy March! Spring is near. Thank the lord. It snowing here again! Why is it snowing again? The remaining snow is completely frozen and it's an ice skating rink in my front yard. I need spring ASAP! I have finally had enough. We are big Italian food eaters in our house. Mainly because well were all Italiano and then some. Not that I even look remotely Italian. My skin is 50 shades of white. I have never been tan in my life and never will. The Irish won on that feature. That's OK I won't have wrinkles right? Wish full thinking. I love rice but rice this way is the bomb. Especially when it's stuffed with beef, sausage, pepperoni and cheese. Say what? Why would you just make them with plain old rice when you can add all that goodness. You can have them as a side to dinner, a snack or eat them all as a meal. You can even serve them to a crowd. They may look complicated to make but I can assure you they are not. There are many different versions. You can make them plain, with meat and peas, with mushrooms or like this. I am not a fan of the pea version. I don't know what it is but I can only eat peas a certain way. Call me weird. Happy Monday all! In a large pot, combine rice and chicken broth and bring to a boil. When water boils, lower heat to a simmer and cover. Cook for 18 minutes or until rice has almost absorbed all the chicken broth. Then let rice stand for an additional 15 minutes. In a sauté pan, cook ground beef and sausage on medium high heat until well browned, breaking up the meat with a wooden spoon. Then, in a mixing bowl, combine 2 raw scrambled eggs, cooked rice, ground beef, sausage, pepperoni, 1 cup of bread crumbs, and the parmesan cheese. Mix ingredients together so mixture is well combined. Add salt and pepper to taste. 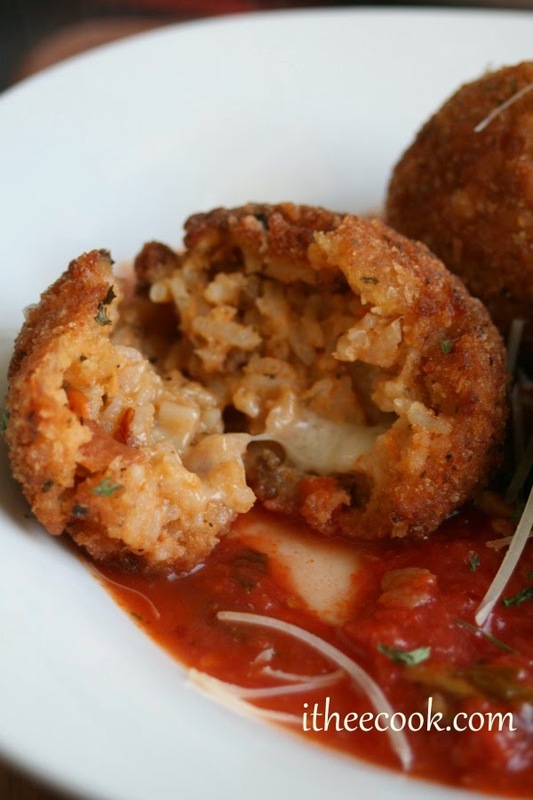 To form the rice balls, take a baby mozzarella ball and roll 3 tablespoons worth of the rice mixture around it to form a ball, ensuring the cheese is fully covered. Form all rice balls and set aside. Scramble the remaining eggs with the milk in a bowl. Place the remaining bread crumbs on a separate plate. Take each rice ball one at a time and roll in flour coating completely then dip it into the egg mixture to coat and then in the bread crumbs so they are coated thoroughly. Set aside. Heat oil to medium high heat and fry the rice balls for about 4-5 minutes or until golden brown, turning as necessary. Remove the rice balls with a slotted spoon. 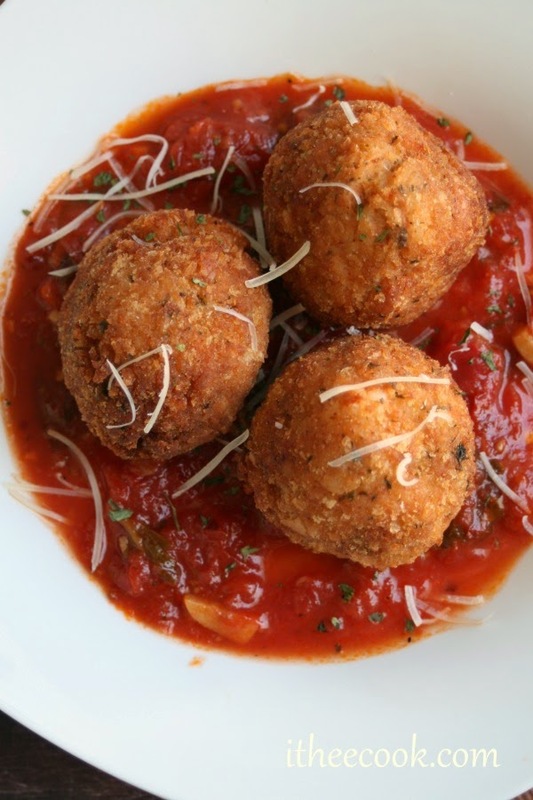 Let stand for 3 minutes and serve with a side of marinara sauce. These look so good! It's a good thing I don't like to fry, I'd probably end up eating the whole tray of them! Can you just use rice and cheese? Yes you can! They are delicious either way! Look so yummie! A must try weekend dishes to make. Thanks for the recipe, Rina! Pinned it! I have to tell you, that I could eat rice balls everyday of my life. Fabulous recipe. So yummy! 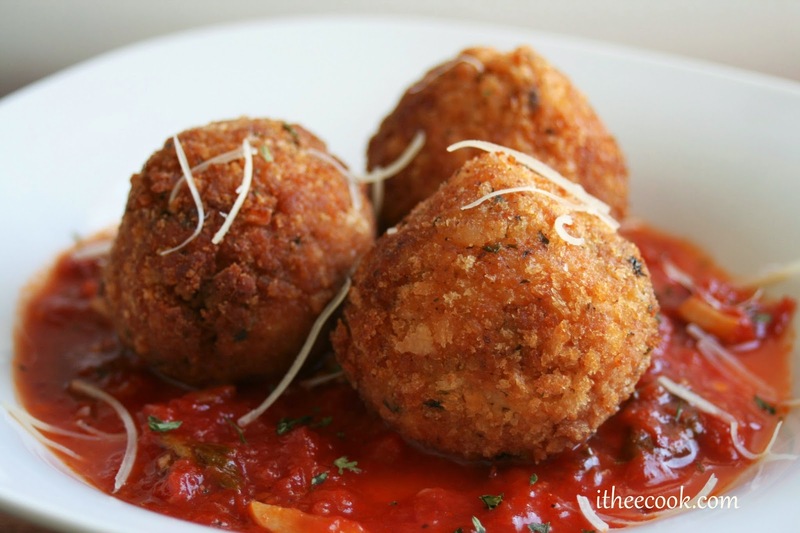 These would be perfect as appetizers for a dinner party! This is every kind of amazing! Thanks for linking up with What's Cookin' Wednesday!